It’s been six years since LeBron James last won Most Valuable Player. That may not seem like a long time, but consider that when James won the award in 2013, the Golden State Warriors were the No. 6 seed in the West, Russell Westbrook and Kevin Durant were best friends, and Tim Duncan was an All-Star. In other words, six years may not seem like a long time, but the landscape of the NBA was vastly different at that time. Since being named MVP in 2013, James has won a championship with two different teams and joined a third. And it’s here in Los Angeles that James, playing in his 16th NBA season at 34 years old, finds himself as an unlikely and yet totally expected MVP candidate. 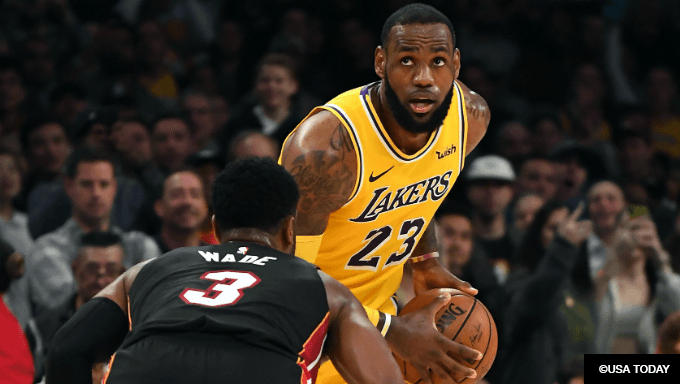 For fans of NBA betting, there’s a strategy to betting on an NBA MVP, and James certainly was one of the best 2018-19 NBA MVP bets before the season. His numbers are off the charts, regardless of his age, he’s taken a Lakers team and built them into a contender and is doing it with all the flair and dramatic that we expected to see in Hollywood and is so important when considering a Most Valuable Player. James is averaging 28.3 points per game on 52.1 percent shooting. The points mark his highest output since 2009 when he was a spry 24-year-old averaging nearly 38 minutes per game. He’s also pitching in 2.2 3-pointers per game, a career-best number, at a 37 percent clip, his best mark since his final season in Miami. Remember, too, when comparing James’ numbers to others in the league that he’s about to turn 34. He has logged more than 55,000 career minutes between the regular and postseason. His fellow draft class buddies, such as Dwyane Wade and Carmelo Antony, are on the tail end of their careers. James? He’s fifth in the league in PER, 14th in minutes and third in points. He’s doing this all at a time in his career when players are accepting bench roles if they haven’t already retired. That narrative could certainly play into his favor. Don’t forget that the people who determine the MVP, the media, are always on the prowl for storylines. They’re not simply plugging numbers into an equation that spits out an answer. James’ season means more because of where he is in his career, his highly publicized move to Hollywood and what he’s doing with his team. James won’t walk to his fifth MVP award. Giannis Antetokounmpo is putting up historic numbers for a Bucks team that looks like it could play into late May or early June. Kawhi Leonard has been the best player on the league’s best team to date, while Anthony Davis’ numbers are unparalleled in New Orleans. Still, there’s something about what James is doing that feels MVP-worthy. Of the aforementioned players he’s on easily the least talented team, and yet his numbers and team record are above even the loftiest of expectations outsiders had for him and the Lakers. James is currently at +300 with 888Sport, just below Giannis’ +250 odds and right in front of Steph Curry (+500), Davis (+500) and Leonard (+750). But given everything that’s gone on, the team he’s playing with and the age/experience at which he’s putting these numbers up, James is looking like a seriously good bet to bring home yet another MVP award. No one really knew what to make of the Lakers coming into this season. They had the world’s greatest player, true, but this was still a 35-win team from a year ago that added a bunch of castaway veterans on one-year deals to fill the bench. How would the young talent built through years of Lottery picks respond to LeBron’s tough love, and could the veterans come together and form a formidable second unit? Fast forward three months and the Lakers are rolling. The 2-5 start was expected while James felt out the roster, head coach Luke Walton found the right rotations and the veterans settled into their new roles. Since that ugly stretch to begin the season the Lakers have gone 15-5 and have the ninth best net rating in the NBA. They’ve had the third best defense in the league in that span after being one of the worst defenses through the season’s first two weeks. Now this Lakers team sits in fifth place in the tightly contested Western Conference and just 1.5 games back of the Golden State Warriors. Kyle Kuzma and Lonzo Ball are meshing perfectly with James, JaVale McGee could win Most Improved Player (though Sacramento’s De’Aaron Fox is a good bet, too)) and the veteran bench is thriving with guys like Lance Stephenson and Kentavious Caldwell-Pope. It’s worth mentioning that they might also add Phoenix’s Trevor Ariza in the coming week, which would given them a much needed 3-point threat. Yes, a Lakers team that was going nowhere fast the last four seasons has become a contender in the gauntlet of the Western Conference thanks to King James.